An optical micrograph shows lanthanum superhydride heated by a laser under extreme pressures. Back in 1911, the Dutch physicist Heike Kamerlingh Onnes discovered that at extremely low temperatures, certain substances exhibit unusual electrical properties. Under normal circumstances, an electric current passing through a conductive material (like a copper wire) will lose some intensity along the way. Even the very good conductors we use in our electric grids are imperfect and fail to transport all the energy from a power station to your wall outlet. Some electrons just get lost along the way. But superconductors are different. An electric current introduced into a loop of superconducting wire will continue to circle forever, without any loss. Superconductors expel magnetic fields, and therefore powerfully push away magnets. They have applications in high-speed computing and other technologies. The problem is that the sorts of extremely low temperatures at which superconductors usually operate make them impractical for common use. For more than a century, physicists have hunted for superconductivity in warmer materials. But finding superconductivity is a bit like striking gold: Past experience and theories might tell you broadly where to look for it, but you won't actually know where it is until you do the expensive, time-consuming work of checking. "You have so many materials. You have a huge space to explore," said Lilia Boeri, a physicist at Sapienza University of Rome, who presented work after Hemley exploring the possibility of superconductors even warmer than LaH10, and explaining why materials like this are superconductive at extreme pressures. In 1986, researchers uncovered ceramics that were superconductive at temperatures as high as 30 degrees above absolute zero, or minus 406 degrees Fahrenheit (minus 243 degrees Celsius). Later, in the 1990s, researchers first looked in earnest at very high pressures, to see if they might reveal new kinds of superconductors. But at that point, Boeri told Live Science, there still wasn't any good way to determine whether a material would turn out to be superconductive, or at what temperature it would do so, until it was tested. As a result, critical temperature records — the temperatures at which superconductivity appears — stayed very low. "The theoretical framework was there, but they didn't have the ability to use it," Boeri said. 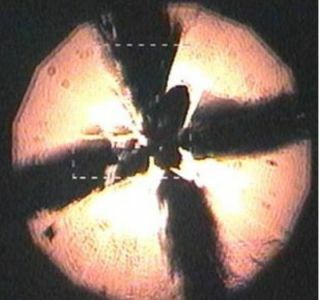 The next big breakthrough came in 2001, when researchers showed that magnesium diboride (MgB2) was superconductive at 39 degrees above absolute zero, or minus 389 F (minus 234 C). "[Thirty-nine degrees] was pretty low," she said, "but at that time was a major breakthrough, because it showed you could have superconductivity with a critical temperature that was twice as high as what was previously thought possible." Since then, the hunt for warm superconductors has shifted in two key ways: Materials scientists realized that lighter elements offered tantalizing possibilities for superconduction. Meanwhile, computer models advanced to the point where theorists could predict in advance precisely how materials might behave in extreme circumstances. Physicists started in the obvious place. "So, you want to use light elements, and the lightest element is hydrogen," Boeri said. "But the problem is hydrogen itself — this cannot be made superconducting, because it's an insulator [a material that doesn't typically allow electricity through]. So, to have a superconductor, you first have to make it a metal. You have to do something to it, and the best thing you can do is squeeze it." In theory, hydrogen is one of them. But there's a problem. "That requires much higher pressure than can be done using existing technology," Hemley said in his talk. That leaves researchers hunting for materials containing lots of hydrogen that will form metals — and, hopefully, become superconductive, at achievable pressures. Right now, Boeri said, theorists working with computer models offer experimentalists materials that may be superconductors. And the experimentalists pick the best options to test out. There are limits to the value of those models, though, Hemley said. Not every prediction pans out in the lab. "One can use calculations very effectively in this work, but one needs to do that critically and provide ultimately experimental tests," he told the assembled crowd. Hemley and his team's "room temperature superconductor," LaH10, appears to be the most exciting result yet from this new era of research. Crushed to about 1 million times the pressure of Earth's atmosphere (200 gigapascals) between the points of two counterposed diamonds, a sample of LaH10 appears to become superconductive at 260 degrees above absolute zero, or 8 F (minus 13 C). A diagram shows the diamond-anvil cell device used to crush the lanthanum and hydrogen together, along with the chemical structure they form under those pressures. Another run of the experiment described in the same paper appeared to show superconductivity at 280 degrees above absolute zero, or 44 F (7 C). That's a chilly room temperature, but not too difficult a temperature to achieve. Hemley ended his talk by suggesting that, down the road, this high-pressure work might lead to materials that are superconductors at both warm temperatures and normal pressures. Perhaps a material, once pressurized, might remain a superconductor after the pressure is released, he said. Or perhaps the lessons about chemical structure learned at high temperatures might point the way to superconductive low-pressure structures. That would be a game changer, Boeri said. "This thing is basically fundamental research. It has no application," she said. "But let's say you come up with something that works at pressure, say, 10 times lower than now. This opens up the door to superconducting wires, other things." Asked whether she expects to see a room-temperature, room-pressure superconductor in her lifetime, she nodded enthusiastically.